With a healthcare provider on-call 24 hours a day to attend to urgent health concerns, support is never more than a phone call away. Our medical team has years of experience with managing and coordinating care of children and adolescents with complicated medical needs, so no question is too big or too small. We are here to support families in their goal to raise healthy, resilient children. ”Dr. G is amazing! The wait is never long and she is always friendly and upbeat. Anytime I have called in with a question I have received a quick response from Dr. G herself. I have referred many of my friends to her and will be very sad when we have to move and switch doctors." ”Dr. Snyder has been our pediatrician since my 11 year old was a newborn. He is a such a good doctor that we have kept him as our doctor even though we do not live near his office (near SDSU). He has a great approach with children, explaining what he’s doing before he does it, and making sure that the child enjoys coming to the doctor. He makes you feel like there are no other patients but you. He is patient and kind and not overly aggressive with prescribing medications if there are less invasive ways to solve the problem. He is fantastic!" ”My experience with this office has been great! Dr. Snyder is wonderful and the nurses have been so helpful. I left another practice and came to this one (recommended by a family member). I’m so glad I did." ”Dr. Snyder was on the list of referrals from my OB and I was sold when she said that he was her kids’ doctor 30 years ago. I trust my OB a lot so it was an easy choice. Dr. Snyder was very helpful when my daughter was first born. She was not taking to breastfeeding and he suggested using a tube at the breast to get her to start realizing “hey this is where food comes from!” Within 24 hours, my little gal had it and she started gaining weight fast! Now that she has had a few more check-ups we have had the opportunity to meet the nurse practitioners and the other doctors in the office, all of which are just as nice and informative as Dr. Snyder. I am so glad I went with my doctor’s suggestion and look forward to my daughter growing up in their care." ”We have been going to San Diego Pediatrics since the birth of our twins in 2009. Every visit is personal; details about our children, how big they have gotten, even memories of past injuries… Every person makes us feel so important and valued. We first met Dr. G when our twins were in the NICU, and she can still recall details of our very first conversation! Dr. Snyder, Dr. G, and Dr. Abramson show the most incredible patience, love, and kindness to their patients, and offer new parents more information than we could ever request! We have the most unbelievable amount of confidence in these doctors, as well as their staff, to provide the best possible care for our precious children. 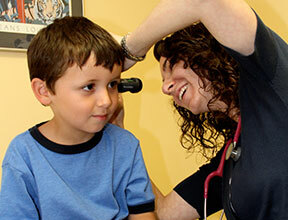 We are endlessly grateful that we chose them to be our pediatricians!"